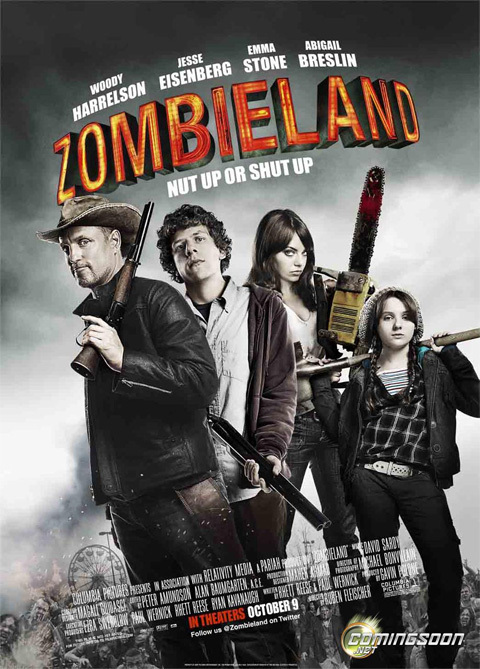 The best part of this rather lackluster poster for Zombieland (via ComingSoon) is the tagline - "Nut Up or Shut Up." But other than that, this is bland. The whole thing just feels off-centered. I know that it's tilted (which seems to be an increasing trend with posters these days), but it looks shifted to the right too much. And the damn coloring just annoys me. Why is everything almost black and white, except for the chainsaw, Tallahassee's left holster, and the insides of Little Rock's jacket? It really makes no sense. Please tell me this was just a screwed up version and it's actually fully colored? Because this movie deserves a better poster! The colors are "muted." Perhaps you've heard of the term? Nut up or shut up. nice. I'm kinda sick of hearing about this movie. We get it. the muted colors really help the title of the movie pop in that brighter, more vivid, orange. its a pretty good character poster, but it could be better. I don't really see Abigail Breslin taking out too many zombies. Poster could be better. #5 its a poster for the movie, how are you already sick of hearing about it? It looks awesome! Emma Stone's looking good! Emma Stone doing her best Mila Kunis impression. Hot x2. Emma Stone's looking like Mila Kunis! I saw this movie last week at a pre screening. I dont remember the last time i laughed that hard in the theater. Great movie. Looks like a poster for a classic movie, not bad though. I thought Emma Stone's weapon of choice was the shotty and Woody had the saw and other melee weapons. Why are they switched in the poster? Is there even a visual advantage cause of it? Anyway, it looks ok. The zombies could be higher on the page. Good poster. Please acquire better taste or a more meaningful existence.